Sitting in front of a computer or performing in repetitive activities such as weightlifting or volleyball can lead to tight chest muscles that may impair an individual’s posture and function. The pectoralis muscles, both major and minor, attach at the sternum (breastbone) and to the bones of the shoulder and upper arm. The pectoralis major is a strong, fan-shaped muscle that begins at the clavicle and sternum to insert onto the humerus. This muscle works to flex or medially rotate the arm at the shoulder joint. It also plays an important role as an accessory breathing muscle to help with inspiration. The pectoralis minor begins from the third through fifth ribs and extends diagonally up the chest to attach to the scapula. It helps draw the scapula forward and downward. Both of these muscles work together to allow you to horizontally adduct your shoulders to bring it in and across your body. Tight chest muscles may lead to a decreased range of motion and difficulty with performing daily activities that involve lifting or pushing. Read below to learn five effective stretches to release tension in the chest muscles. Stand beside a door frame or corner of a wall. Keeping your back straight and your inner core engaged, bring your arm up against the wall with the elbow and shoulder bent at 90 degrees. With the arm planted on the wall, draw your opposite shoulder back followed by your torso in a straight line. Keep the back straight and core engaged. Hold this for 30 seconds and repeat 3 times on each side 2 times per day. Kneel on the floor with knees hip-width apart and your hands on your waist. Tuck your toes or place them flat against the floor. Slowly reach back and place one hand on each heel. Keep your chest lifted, shoulders back and down, engage your core and slowly push your hips forward. Hold for 15-20 seconds and repeat 3 times. Stand tall with your feet shoulder-width apart. Interlace your fingers behind your back and straighten your arms. Keep your chest lifted and pull your shoulder blades downward. Hold for 15-20 seconds and repeat 3 times. Lie flat on your back with feet hip-width apart and flat on the floor. Position both arms to the side at a 90 degree angle with palms facing upwards toward the ceiling. Keeping in contact with the floor at all times, slowly bring your arms up over your head until they are fully extended. Then slowly bring both arms back to the 90 degree starting position. Repeat 10 times for 3 sets. Remember to keep your back flat against the floor and ribs tucked at all times. 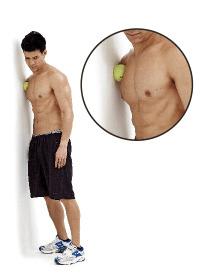 Place a lacrosse or tennis ball between your pectoralis muscles and a doorway or the wall. Slowly lean your body onto the ball for 20-30 seconds to release tension in the muscle. Move the ball to other points in the chest area and repeat the previous step.